Almost everyone underestimates the pre-packing time needed to pack small items. If packing yourself, start well before the moving date and check our hints on packing your small items section. You can also view our video, Packing and Moving Made Easy. Our packing hints are designed to help you pack properly. Unfortunately our written guarantee of care does not cover items that you have packed yourself. If you are concerned by this, and want your small items covered, then call us and we can send a professional pre-packer, who will pack whatever you need. Butchers paper is highly recommended over using old newspapers for wrapping everything for your Pre Pack. Our industry has outlawed the use of newspaper for professional packing as there is a chance of ink poisoning from ink transfer on packed goods. You will also not have to re wash your goods upon arrival when using butchers paper. It is always better to use actual removal cartons when packing, these have been designed by our industry for Removal Pre Packing for a reason. There are 2 basic sizes available when selecting your cartons, Standard cartons (tea chest) 65cmx45cmx40cm and book/wine cartons 40cmx40cmx30cm. Using these two sizes not only makes packing easier on your end but makes a much your removalists job much easier on uplift. Portarobes for your hanging clothes can be supplied. To work out Portarobe requirements for your relocation, the general formula is for every lineal metre of hanging space equals one Portarobe. Please contact our sales team for more details, and pricing should you wish to purchase these for further use in storage, or later removals. When trying to work out how many cartons you will require for your move, we recommend you speak to our sales team for an estimate of cartons required for your move. We have created very accurate formulas regarding cartons required based on house sizes and our experience. 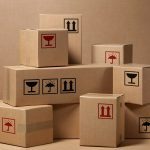 Taping cartons is an important factor, Tewantin Furniture Removals recommends setting up your carton with the 4 flaps all folded in, and taping both ways across the bottom and top of the carton. Never fold the four flaps into each other without taping as the bottom will simply fall out as soon as the carton is moved. When using archive boxes always tape both ways on the base, and tape the top of the carton to prevent movement. Archive cartons are notorious for coming apart during removal. Cartons should not be packed over 25 kilos each (the general rule is if you can comfortable move the carton yourself, our staff will have no problems). To facilitate this we recommend using Book / Wine cartons for all your heavier items (books/wine/cutlery/folders/files/bottles/alchohol/dvds/videos/pantry goods/cans). Standard Cartons are best used for clothing / linen / dooners / pillows / lamps / lampshades / and any other reasonable weighted goods. Plastic Crates are now becoming very popular, these are fine to use but must be packed with common sense in mind. They are generally designed to carry 10 – 15 kilos only. Do not fill with books or any other heavy items as they will simply disintegrate upon uplift and transport. When packing dinner sets, Plates, bowls and dishes etc need to be packed on their edges with a layer of padding below and above each layer in the carton. The edge of the plates, bowls and dishes is the strongest point to eliminate the vibration and any pressure during the transit period. Cups, glasses, flutes etc need to be packed vertically in a carton. Once again with a layer of padding below and above each layer in the carton. Cartons must to be filled to the top to ensure carton strength, and reduce the possibility of cartons collapsing during transit. Even if you need to fill with padding, or scrunched paper please ensure that cartons are full and tightly packed. With any pictures, picture packs are available, but Movers R Us has a felt padding and Shrink wrap procedure available that we prefer and perform as part of any removal at no extra cost. This process is best for any picture too big to be packed into standard cartons. This procedure is much safer for your pictures and frames as it eliminates the potential of scratching from the carton rubbing on the print, canvas or frame. All cartons should be marked with which room they have come from, client name, and all fragile or top load cartons labelled accordingly. The simple rule is to pack everything that can fit into Cartons into Cartons and leave the rest to our staff. Plasmas/LCDs Monitors etc are better left out for our staff to wrap in Felts and Shrink Wrap for safer transit.